This is part 2 of the From Inception to App Store series that teaches you how to take an app from the idea phase to final release in the App Store. In my previous post, I gave an overview of the Robot Tic-Tac-Toe app I created for this series, which you can download for free from this link. I have worked with many companies creating mobile apps, and I'm often surprised at how little research some developers do before deciding to spend a tremendous amount of time and energy creating an app. Performing advance research helps ensure you have a viable app idea! One of the challenges of creating an iOS app is getting noticed among the 1.5 million apps in the App Store. However, this can be used to your advantage, because it allows you to test your app idea against your potential competitors. Unless your app is completely and utterly original (very rare) there are other apps in the store you can examine to decide if you should pursue your app idea. Ultimately, if you discover there are multiple apps similar to your own that are highly rated and selling well, but you don't have anything new or exceptional to offer in your own app, it's best to abandon the idea and search for a new one. However, if you find there are mostly poor-to-moderate reviews of similar apps, or if you have something unique to offer that will make your app stand out from the crowd, then you should go for it. A character (the Robot), which the user could play against. 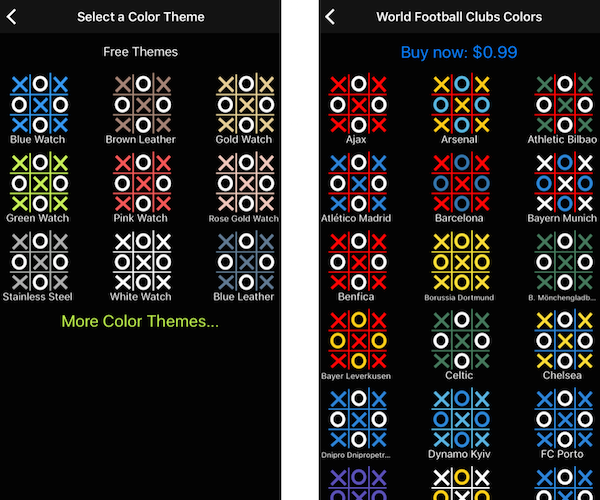 Include color themes that match the latest Apple phones and Apple Watch wristbands, as well as colors for sports teams, countries, and famous artists. Include a variety of sound themes. This includes sounds that are played as each player makes a move, as well as a short song tht plays at the end of each game (the song varies based on whether the user wins, loses, or ties the game). There is much to be learned from reading user reviews of competing apps. They allow you to discover what users like and dislike, and you can design your app accordingly. For example, I read a number of unfavorable reviews of one Tic-Tac-Toe app where users complained that whenever they made a move, the game made its move "at the same time." Ultimately, the game was calculating and making its move after the user made their move, but it happened so quickly, it appeared to happen at the same time. It was easy for me to add a delay between when the user made their move and when the Robot made its move to avoid this user complaint! I learned this, and much more by reading user reviews. One of the biggest questions you should decide before creating your app is, "How will I earn revenue from this app?" Choosing the best option often depends on the type of app you are creating. If your app will be used infrequently, the best option is to charge for the app up front, or include In-App purchases. If your app is designed to be used more frequently, then any of the above options (or a combination of options) can work well for you. I find it best to offer a subset of In-App purchases for free. It allows users to try different free options, which can then lead to In-App purchases. 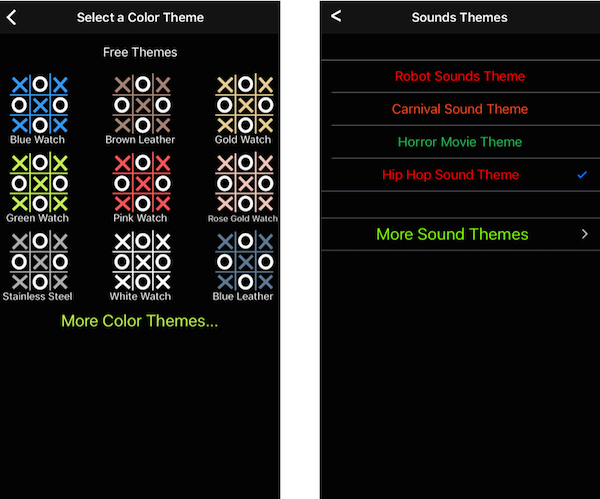 For example, Figure 1 shows free color and sound themes the user can select in the app. If you tap the More Color Themes... button, it takes you to the screen on the left in Figure 2. If you select a color theme from this list, it takes you to the scene on the right in Figure 2, where you can see the full set of colors and the price for the color theme set. One of the best ways to get the word out about your app is to include social media features that are easy to discover and use. For example, Figure 3 shows the Results scene after playing a game of Tic-Tac-Toe. In this screenshot, the player has won five games in a row. Notice the Twitter and Facebook icons at the bottom of the scene. If the user taps one of these icons, it takes them to a dialog that allows them to post their winning streak to social media. It includes an image of the app icon (for branding purposes) and a link to the app's web site where potential users can check out and purchase the app. Now that we have a basic layout of our app's features and a reasonable level of confidence that our app is marketable, we're ready to move on to the technical details of the design and construction phase. I'll covering a wide variety of iOS technologies in detail in upcoming articles in this series, so stay tuned! Kevin McNeish is author of the new book “Learn to Code in Swift” as well as the “iOS App Development for Non-Programmers” book series (www.iOSAppsForNonProgrammers.com), winner of the Publishing Innovation Award. Kevin is also an award-winning app developer, software architect, and conference speaker in the U.S. and abroad. He has spent much of his career making difficult concepts easy to understand. Follow Kevin on Twitter: @kjmcneish.